The first European rules were established, as early as 1956. Through the efforts of the European Union for the Wholesale Trade in Potatoes – now EUROPATAT – professional practices were defined and a simple and efficient procedure for expert assessments and arbitration, known ever since by RUCIP, has been set up. 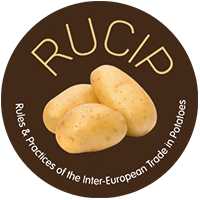 Since then, RUCIP has been used for nearly all European transactions and has several times been modified (in 1972, 1986, 1993, 2000 and 2006), which resulted in a RUCIP which has been adapted to the demands of the trade and the technical evolution within the potato sector. The current version came into force on 1 January 2017. On the same date, the RUCIP European Committee and secretariat moved to the Europatat office in Brussels. The RUCIP 2017 edition focus strictly on the transfer of the European secretariat from Paris to Brussels and on the possibility to create European lists of Experts and Arbitrators for the countries that do not have a National RUCIP secretariat. These National RUCIP secretariats are located in Czech Republic, France, Germany, Ireland, Italy, the Netherlands, Spain, Switzerland and the UK. who make up the RUCIP European Committee recommend all their members to use the current Rules and Practices and the Rules governing expert assessments and arbitration for their national as well as their European transactions. The code name of these rules and practices – under which they have been tried and tested – remains RUCIP.